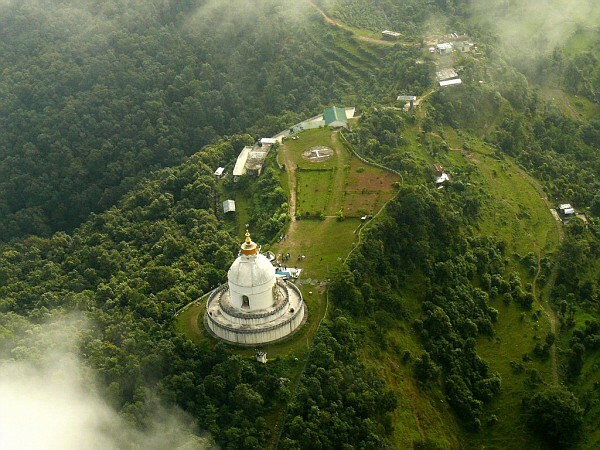 Pokhara is a major tourist center of Nepal. The city offers a combination of nature and culture and is mostly known as the gateway to the trekking route "Round Annapurna", which is usually a trek of 25 days. Pokhara is quite a modern city with only few tourist attractions in the town itself. Most interesting is the old center in the north of the city (Bagar, Purano Bazar) where many old shops and warehouses in the Newari style can still be found. Although more seldom, mule caravans still arrive there from Mustang. The best viewpoint of Pokhara is Sarangkot (1,600 m) and Thulakot (in Lekhnath a part of famous Royal Trek from where four lakes Phewa, Begnas, Khaste and Dipang and whole Annapurna range can be seen) to the west of the city. Paths and a road lead almost to the top of Sarangkot with an excellent view of the mountains and the city. On the summit of Sarankot there is a Buddhist stupa, which also attracts many tourists. The mountain museum is another attraction of Pokhara. Beni lies on the way between pokhara and jomsom…while going to jomsom we have to go through beni…Beni is not really a tourist destination, and compared to other cities, it's one of Nepal's less visited places. Sunrise at 06:14 and Sunset at 18:22. Jomsom has daily flight connections with Pokhara although cloud cover at Pokhara or Jomson and high winds particularly at Jomson might cause delays or cancelations. Airlines covering the area include: Yeti Airlines, Nepal Airlines, Sita Air, Agni Air. Jomsom now has a tenuous road connection with Beni and onwards to Pokhara. The road is prone to landslides and flooding particularly during the monsoon. Jomson is a compact little town. Jomsom beautiful small town situated at 2800 m at Kaligandaki River Valley and lap of Mt Dhaulagiri and mt nilgri.Tibetan culture and beautiful landscapes its feature. 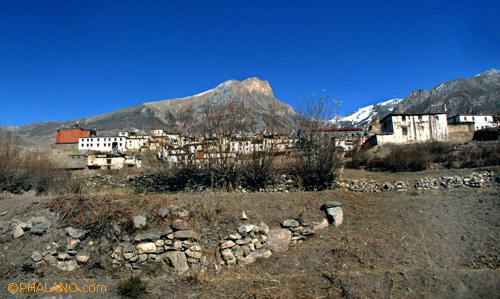 Jomson has few attractions of its own but is a gateway for treks to Muktinath and Lo-Mantang as well as a common end point for treks from Manang. Jomson used to be the half-way point on the Annapurna circuit but with the road construction it has now effectively become its terminus. There are a number of shops selling handicrafts as well as all the items trekkers normally would want from chocolate bars to trekking poles. One of the more unusual items commonly for sale is fossilized saligrams that are found in this area attesting to the fact that this was the sea bottom once! All hotels have attached restaurants with remarkably comprehensive menus and as the food tends to subsidies the room cost you are expected to eat in your hotel or they will increase the room rate! 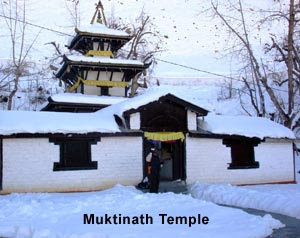 The temple complex of Muktinath sacred to both Buddhist and Hindus for its combination of Earth, water and Fire is a day’s walk or about an hour by jeep away. Kagbeni is a village in Upper Mustang, Nepal, located in the valley of the Kali Gandaki River. Administratively, Kagbeni is a Village Development Committee in Mustang District in the Dhaulagiri Zone of northern Nepal. At the time of the 1991 Nepal census it had a population of 1200 people residing in 260 individual households. 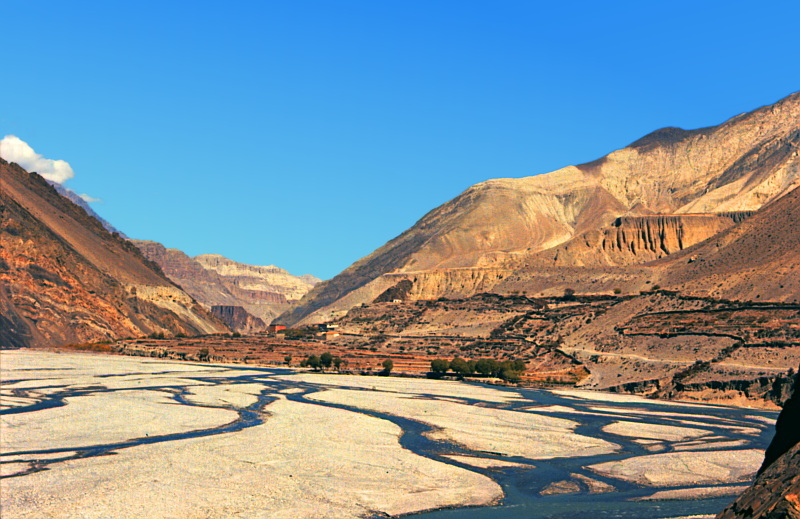 It lies on the trail from Jomsom to the royal capital Lo Manthang, near the junction with the trail to Muktinath. Kagbeni is a desert of Nepal.it is surrounded by mountains…it is beautiful and attractive place. The Tibetan Buddhist tradition states that for this reason Guru Rinpoche, also known as Padmasambhava, the founder of Tibetan Buddhism, had meditated at Muktinath on his way to Tibet. This temple is praised by many saints of Hindu tradition. The scripts narrating the importance of this temple is available in Vishnu Purana with the Gantaki Mahathmya.